(1) 株式会社 豊田自動織機，“コンプレッサーの種類とその構造　片側斜板式（可変容量型）”, https://www.toyota-shokki.co.jp/about_us/business/automobile/compressor/kind_4/index.html （参照日2016年11月2日）. (2) 吉住文太，近藤靖裕，吉田一徳，諸井隆宏，玉野真司，森西洋平，“圧縮機の冷媒ガス吐出用リード弁における開き遅れ現象（開弁過程における油膜挙動の可視化と弁変形計測）”，日本機械学会論文集C 編, Vol. 78, No. 795 (2012), pp. 3787-3802. (3) Bauer, F., “The Influence of Liquids on Compressor Valves”, Proceedings of the 1990 International Compressor Engineering Conference at Purdue (1990), pp. 647-653. (4) Khalifa, H. E., and Liu, X., “Analysis of Stiction Effect on the Dynamics of Compressor Suction Valve”, Proceedings of the 1998 International Compressor Engineering Conference at Purdue (1998), pp. 87-92. (5) Bukac, H., “Understanding Valve Dynamics”, Sixteenth International Compressor Engineering Conference at Purdue (2002), C15-3. (6) Courtois, S., Arnoult, E., Wagstaff, P., and Gavric, L., “On Finite Element Modeling of Valve Dynamics: Impacts, Oil Stiction, Gas Flow, …”, Sixteenth International Compressor Engineering Conference at Purdue (2002), C13-2. (7) Hays, D. F., and Feiten, J. B., “Cavitation between Moving Parallel Plates”, In Proceedings of the Symposium on Cavitation in Real Liquids (GM Research Labs, Warren, Michigan; Elsevier Publishing Co., New York) (1962)，pp. 122-138. (8) Haber, S., and Etsion, I., “Analysis of an Oscillatory Oil Squeeze Film Containing a Central Gas Bubble”, ASLE Transactions, Vol. 28, No. 2 (1985), pp. 253-260. (9) Boedo, S., and Booker, J. F., “Cavitation in Normal Separation of Square and Circular Plates”, Transactions of the ASME, Journal of Tribology, Vol. 117, No. 3 (1995), pp. 403-410. (10) Optasanu, V., and Bonneau, D., “Finite Element Mass-Conserving Cavitation Algorithm in Pure Squeeze Motion. Validation/Application to a Connecting-Rod Small End Bearing”, Transactions of the ASME, Journal of Tribology, Vol. 122, No. 1 (2000), pp. 162-169. (11) Sun, D. C., Wang, W., Zhang, Z., Chen, X., and Sun, M., “Theory of Cavitation in an Oscillatory Oil Squeeze Film”, Tribology Transactions, Vol. 51, Issue 3 (2008), pp. 332-340. (12) Temperley，H. N. V., “The Tensile Strength of Liquids”, In Cavitation and Related Phenomena in Lubrication, Proceedings of the 1st Leeds-Lyon Symposium on Tribology, University of Leeds, Leeds, UK (Mechanical Engineering Publications Ltd, London, UK) (1974), pp. 11-13. (13) Natsumeda, S., and Someya, T., “The Effect of the Surface Dilational Viscosity to the Negative Pressure in the Oil Film of Journal Bearing”, Proceedings of the Japan International Tribology Conference (1990), pp. 1617-1622. 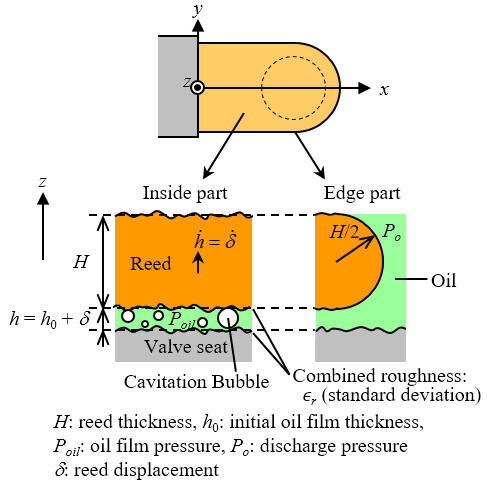 (14) Geike, T., and Popov, V. L., “A Bubble Dynamics Based Approach to the Simulation of Cavitation in Lubricated Contacts”, Transactions of the ASME, Journal of Tribology, Vol. 131, No. 1 (2009), 011704. 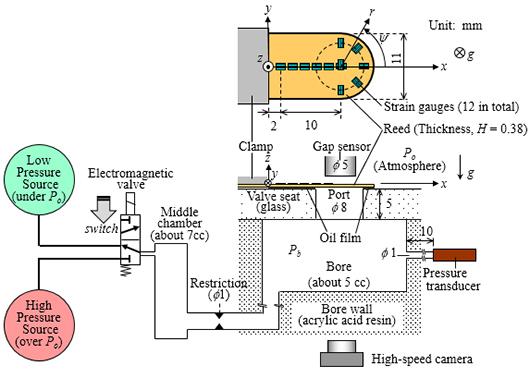 (15) Gehannin, J., Arghir, M., and Bonneau, O., “Evaluation of Rayleigh-Plesset Equation Based Cavitation Models for Squeeze Film Dampers”, Transactions of the ASME, Journal of Tribology, Vol. 131, No. 2 (2009), 024501. (16) 黒田成昭，堀幸夫，“スクイズフィルムの研究－負のスクイズにおけるキャビテーションと流体内張力について－”，潤滑, Vol. 23, No. 6 (1978), pp. 436-442. (17) Sun, M., Zhang, Z., Chen, X., Wang, W., Meng, K., and Sun, D. C., “Experimental Study of Cavitation in an Oscillatory Oil Squeeze Film”, Tribology Transactions, Vol. 51, Issue 3 (2008), pp. 341-350. (18) 吉住文太，近藤靖裕，諸井隆宏，玉野真司，森西洋平，“圧縮機の吐出用リード弁における開き遅れ挙動の計算（弁変形-ガス流れ-油膜流れ連成計算のためのモデル化）”，日本機械学会論文集B 編，Vol. 79, No. 806 (2013), pp. 1985-2002，およびVol. 79, No. 808 (2013), p. 2885. (19) 吉住文太，近藤靖裕，諸井隆宏，玉野真司，森西洋平，“圧縮機の吐出用リード弁における開き遅れ挙動の計算（弁変形-ガス流れ-油膜流れ連成挙動と開弁メカニズム）”，日本機械学会論文集B編, Vol. 79, No. 806 (2013), pp. 2003-2018. (20) 井田富夫，杉谷恒也，“圧力変化を受ける油中の気ほうの運動：第1報，単一気ほうの実験解析”，日本機械学会論文集B編, Vol. 45, No. 399 (1979), pp. 1650-1658. (21) 吉住文太，諸井隆宏，玉野真司，森西洋平，“圧縮機の吐出用リード弁の開き遅れ挙動における作動条件と弁剛性の影響”，日本機械学会論文集, Vol. 80, No. 812 (2014), FE0091, pp. 1-15.